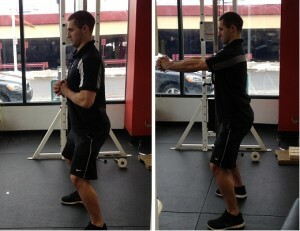 How to hit your entire “core” in one swipe either at home or in any training facility. Some sample exercises, modifications and progressions so you can make this routine easier, more challenging, and so you are able to switch things up after a while. How to perform the exercises properly, common mistakes, and how to fix them with video and picture demonstrations. Let’s hop right into this. This is where you will be training your “six pack” by preventing your lower back from arching. 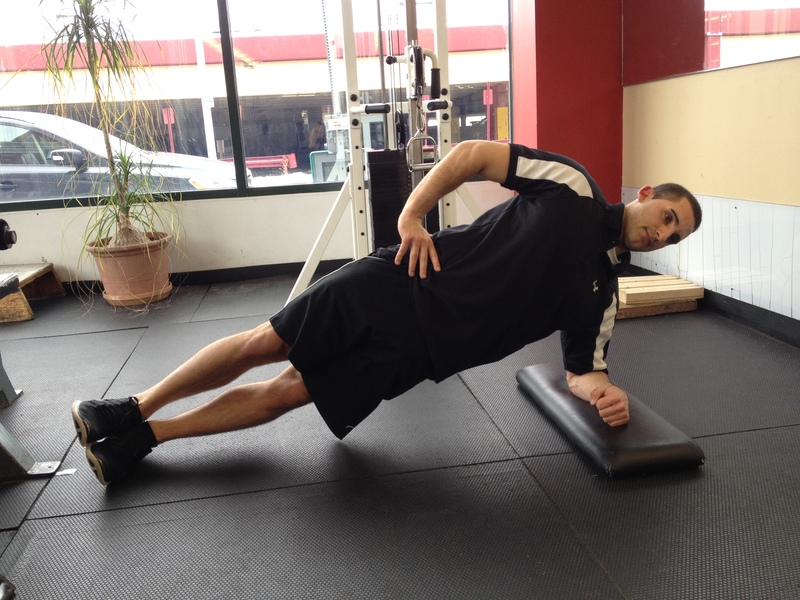 Using proper terminology you will be preventing lumbar extension and using your rectus abdominus. Exercises like planks, push ups, ab dolly, stability ball, or barbell rollouts, suspension fallouts etc. belong in this category. The pictures below represent a logical sequence of planks with the difficulty ranging from less challenging (hands elevated on the bench) to more challenging (elbows on the floor). There are many more variations but this is a very simple progression to follow. They are even more challenging if you add weight on your back, or movement of the limbs with maintaining the proper core and spinal positon. For these exercises it would be beneficial of you follow the technique dowel rod rules I presented in this popular article “You Must Learn This Before You Start Training” here. This is one of the quickest ways to make sure you have good body alignment. I’ll show you again below anyways. During ANY anti-extension exercise you can double check your technique by making sure a dowel rod maintains contact with the back of your head (occipital region), in between your shoulder blades (scapula), and on your tailbone (sacrum). If you lose contact in one of those spots during a movement or exercise, something is out of alignment. Both these examples show poor positioning. To correct it, just reassure the dowel rod is in contact with the back of your head, in between your shoulder blades, and your tailbone like mentioned above. Squeeze the glutes and quadriceps. Keep the ribs down and the stomach tight. Don’t let the shoulder blade protrude away from your back. This is where the vertebral border of the scapula lifting away from the thorax. In Laymon’s terms this is where you are not letting your body twist through your stomach and lower back. You will be hitting your “love handles”. Using proper terminology you are resisting rotation through the core and lumbar spine. 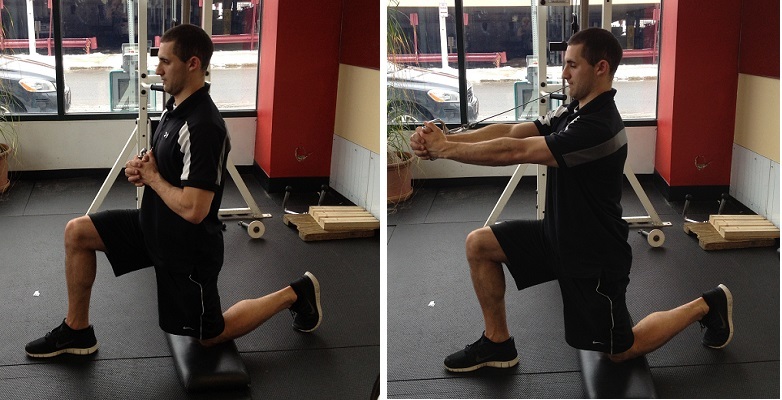 Exercises like palloff press variations (kneeling, 1/2 kneeling, standing etc. ), landmine rotations, tornado ball exercises, and rotational cable push pull exercises without letting your spine rotate will do. Look below to see some examples. We all now by now the key is to not let the core or lumbar (stomach or low back) move. Anit-rotation: Half kneeling and standing palloff presses in the pictures below. Using proper terminology you are resisting flexion through your lumbar spine. In simple terms you are not allowing your lower back to round while an external load is trying to make you do so. Exercises in this category include squat and deadlift variations, all types of carrying exercises (goblet, front loaded, and zercher carries), reverse hypers, and back extensions. The key again is keeping your core and lumbar (stomach and lower back) in neutral alignment. You can even hold an object in front of you with bent or extended arms while keeping your core and lumbar in neutral alignment. This is where you are preventing your body from bending to the side through your lower back. You will be using your “love handles” yet again. Using proper terminology this where you are resisting lateral flexion through the lumbar spine. Exercises in this category include side plank and offset carrying variations. To break this down in simple terms, your keeping your stomach and low back straight, while simultaneously pulling your knee (s) upward. Using proper terminology you will be keeping your core and lumbar spine in a neutral position, while flexing either one or both hips. Exercises in this category include hanging leg raises, leg lowering variations, mountain climber or knee drive variations, stability ball jackknifes etc. Below I give you some examples. Now that you have just learned some sample exercises, technique, and regressions and progressions let’s move onto how this challenge is going to be performed. It’s a pretty simple five steps. Five exercises: Pick one from each category mentioned above. Five minutes: Each exercise will be performed for one minute. Five “breaks”: You can take up to five “breaks” whenever you want throughout the five minutes. Five seconds rest: You can only take five seconds rest at each break. That’s twenty five seconds rest total within the five minutes. Five high. I mean, a high five. Yes, you get one personally from me. But that’s only for those who complete the challenge. Show me a video of yourself performing this and I’ll give you some daps. If this is too challenging for you, feel free to make the exercises you chose easier until you can progress. If it’s still too difficult break “The Friendly Five” down into something like this. Pick one exercise from each section above. Perform each exercise for 45 seconds. Rest 15-30 seconds in between each exercise. Rest 60 seconds after all the exercises are completed. How do you program this into your current routine? Perform this before you train. Add it to the end of a training session. Perform this at home or on “off/conditioning/GPP” days. It really can be done whenever you wish. If you want to hit your entire core in five minutes, then give this a shot. Just make sure your technique is up to par and you’re picking exercises that actual challenge you specifically. With the modifications, progressions, and variety of exercises given their anyone can perform this. So grab a partner go after it, and show me a video of you doing it if you wish. P.S. If you have picked the right exercises for yourself you will soon find out “The Friendly Five” isn’t so friendly after all. It may take some experimenting with, but try it out, and let me know how it goes.